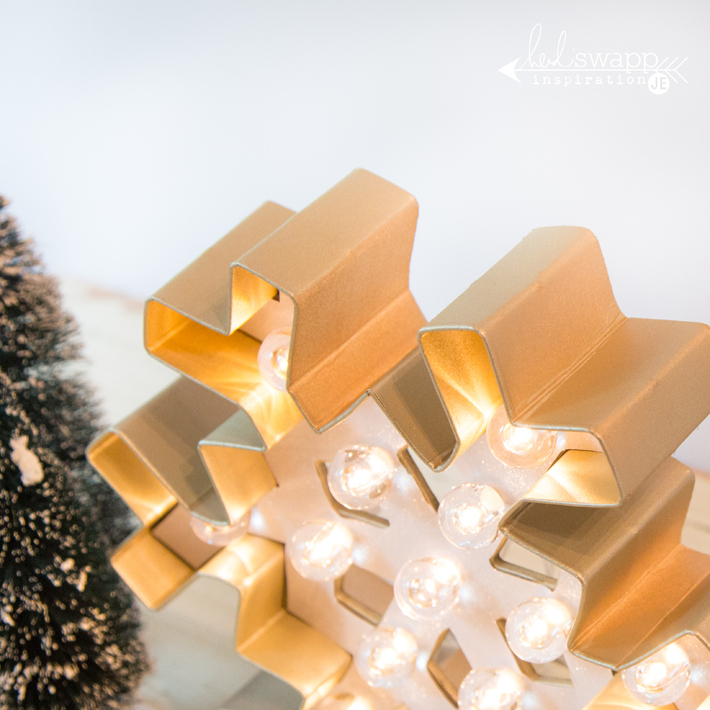 Marquee is HOT this holiday season and you can't go anywhere without seeing it in department stores. Even the big box stores have hopped on the trend and I was drooling over all the beautiful designs at my local Target store. My wallet wouldn't be able to handle all of the designs I wanted to put in my cart! This year, the look I am loving is white with gold. I love the way it looks classically vintage. So, I figured how to get the same look, for less than half the cost of the design I saw in Target! 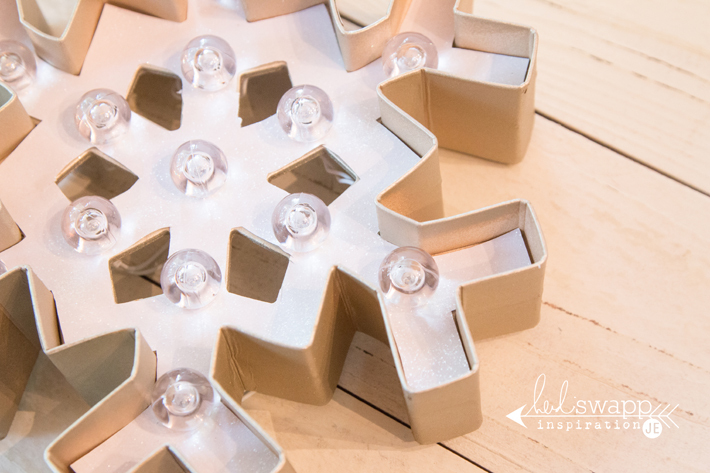 This snowflake marquee by Heidi Swapp can be found at your local Michaels Craft Store. Grab yourself a 40% off coupon and it makes them quite affordable! I used the white glitter paper from the Marquee Love holiday paper pad in collection as well, although you could use any paper you might have on hand. I spray painted the sides with gold paint. Easy! It was done in minutes. After tracing the template that comes in the box, I cut it out and it slid perfectly into the marquee shape. With this shape you need to be careful when punching the holes. Instead of a #2 pencil I used a lead pencil to poke through the small holes. I just needed to be able to see where to place the bulbs. Anything thin could work like a paper piercer or toothpick. Using something thin for this shape will keep you from tearing the paper along the thin parts of the shape. Lastly, I put the bulbs in and then wired the lights in the back. Make sure you follow the directions to where the lights go, especially in this shape. The strand fits snug and tight and will not fit correctly if you don't follow the map in the box. I have never been so excited about a Marquee as I have this one. It looks so good and is so bright! 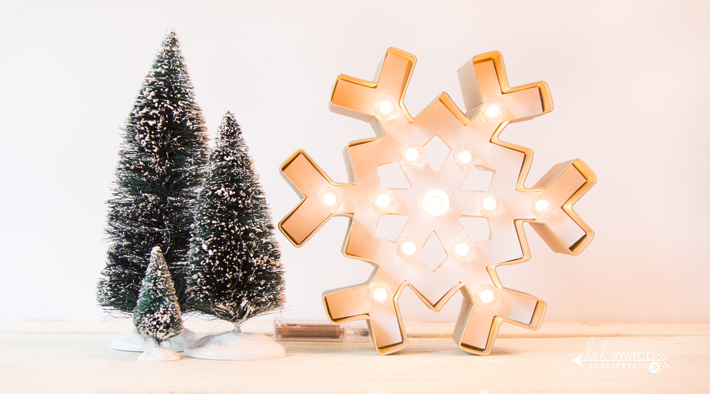 The cut outs in the snowflake really make it shine! Plus, it gives me such satisfaction knowing I got the look I was going for for less! Create Well: See something you like with a price tag you don't? Make it for less.